This was the question Walnut Grove resident Alfred asked his Ackerman Elementary fourth grade reading buddy during a ‘get to know you’ ice-breaker. 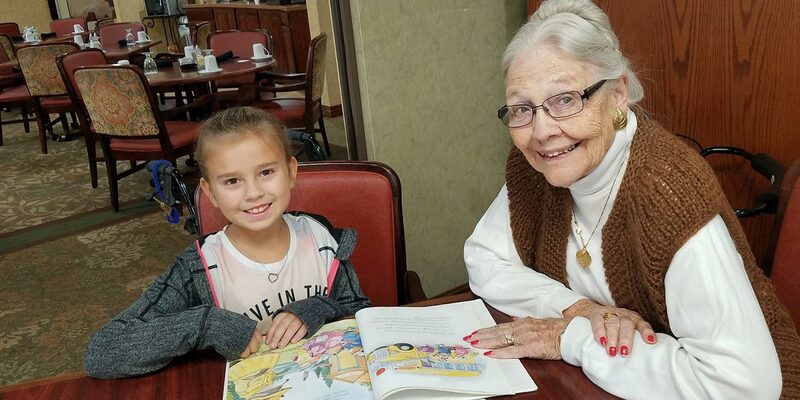 The student and his 23 classmates had walked to the retirement community for the first monthly mentoring collaboration with the residents this past October. The session was part of Project PAYBAC (Partners Assisting Youth, Business, and Community). Founded in 1988, the project links Milliard schools with community businesses to provide new and different ways for students to learn. Kim Spicer, activities director at Walnut Grove, said 20 residents had responded to her call for volunteers, filling the tables of the Ambassador Room to await the arrival of the students. Jody Carhart, the children’s teacher, said the questions were not only meant to break the ice, which in retrospect she said hardly needed breaking, but were also meant to connect to their geography and social studies lessons. The children returned to their classroom with a list of places to learn about after asking the residents where they’d traveled and lived. Before retiring, Alfred taught American history and government in middle school and high school in Omaha for 35 years. Joan did post graduate work at the University of Nebraska and taught western civilization and American history for many years, including four years at Boys Town. Friends don't have to be the same age. The three fourth-grade classes at Ackerman are taking turns for their monthly visit to Walnut Grove. But Mrs. Carhart says her students have already made plans for next time: they want to take Ipads and show their mentoring buddies their school apps.